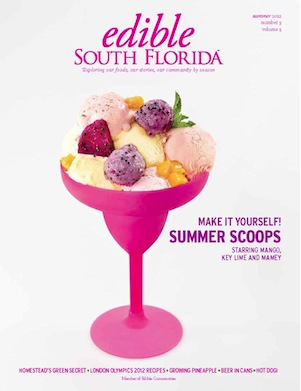 Check out the new issue of Edible South Florida by clicking here or on the cover. Paper copies can be found at Whole Foods. On page 16 of the online viewer one can find my column, “Edible Garden Q & A”. This entry was posted in Edible Garden News and tagged 8' x 4' raised garden bed, arquitectonica, balcony raised bed, build raised bed, building a vegetable garden, building raised beds, building raised garden, coconut grove landscaping, collecting rainwater, community gardens in south florida, community gardens Miami, Dylan terry Miami, Dylan terry ready to grow, edible gardens florida, edible landscape designer, edible landscaping, Edible perennials, Edible plants in South Florida, edible school gardens, everglades tomato, Fairchild Tropical Garden, florida edible plants, garden boxes, garden kits, greenheart 4 x 8, growing bananas in south florida, Growing vegetables in South Florida, Heat tolerant vegetables, herb gardening, Hot weather edible gardens, how to build a garden, how to build a raised garden, how to grow an edible garden in south florida, how to raised garden bed, irrigation for gardens, low maintenance florida garden fruits vegetables, make raised garden bed, Miami herb garden, Miami Permaculture, miamiediblegardens.com, Organic garden company south florida, Organic gardens Miami, organic vegetable maintenance florida, Permaculture for south florida, planting vegetable garden, Rain barrels Miami, Rain barrels south florida, rainwater harvesting, raised bed kits, raised beds service, raised garden beds plans, raised garden designs, raised garden ideas, raised planter, ready to grow gardens, Ready-to-Grow Gardens Miami, reclaimed wood, Slow Food Miami, south florida edible landscaping, south florida edible plants, South Florida herbs, south florida raised bed gardens, tropical fruit trees, vegetable garden designs, vegetable garden planning, vegetable garden plants, vegetable gardening in raised beds, Vegetable plants in Miami Organic vegetable garden, Veggie garden, where can i get compost in Miami, where to buy herb plants in miami florida, wood for raised garden beds. Bookmark the permalink.